SG 176a, 179a, 181a, 189a. Fresh never-hinged mint. Red pen marks on selvedges. Rest of World = £2.
' MILITARY UNIFORMS OF 1897'. STAMP CLEARANCE'. FULL MINT SET, SG 586/590. M/M GOOD, CLEAN FACE. MOUNTED MINT CREAMY GUM. GOOD, CLEAN UNMOUNTED MINT. GUM IS A TOUCH CREAMY. 1903 King Edward VII SG59 1s. 50c may be fiscally used. SG54, 64, 66, 67. FOR CONDITION. UN MOUNTED MINT. Sg 1 31 /1 35 a/ 13 5b /1 36 /1 36 a/ 13 7. C at £ 10. 9 0. 1937 King George VI Coronation. 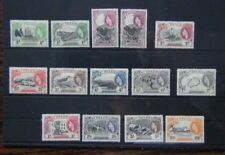 St. Helena Stamps Unused. Dispatched with Royal Mail 2nd Class Letter. Barbados 1937 & 46. George VI Coronation & Victory. SG245/6/7 & 262/3. M/Mint. SG132 1D GREEN. FOR CONDITION. SG138 2/6 MAROON. FOR CONDITION. St Helena SG55 1/2d Brown Green-Grey lightly mounted mint. St.Helena Used Stamp x1. 1938. For further information please see photos or message me.